Good hearing is a vital part of our work in broadcasting, but how often do we take it for granted? Music producer and BBC sound engineer Clive Williamson looks at the potential hazards to our hearing in the workplace and in our social lives, and discovers a new product which can help protect and conserve our hearing, and make sure that it lasts us a lifetime! Ask any sound engineer or radio producer what his or her most valuable asset is, and they will probably have to think hard about it and might eventually say, “My ears, I suppose!” The ridiculous truth is that most of us using our ears professionally every day take our hearing very much for granted. We ignore warning signs from our ears, and can’t begin to imagine what life might be like without normal hearing – until it’s too late! Whether we work as sound engineer, editor, TV or radio producer, or production assistant, it is very easy to over-tax or even permanently damage our ears. It can happen through obvious hazards like working with live bands or public address, or through more subtle sources of trouble: over-loud use of headphones for editing; long-haul flying; or playing regularly in a concert orchestra. Add in factors like personal stereos and anti-social noise generated by tube trains, planes, traffic, neighbours and building work and it’s quite likely that our hearing is facing the greatest onslaught ever! Our sense of hearing can experience various types of loss or change, some of which are short-term and nothing to worry about, whilst others are permanent to a greater or lesser degree. The most common change is known as a temporary threshold shift. This is often experienced after hearing a loud concert, or possibly after a prolonged noisy car or plane journey. The ear’s apparent sensitivity decreases to compensate for continuous loud noise, making it difficult to judge levels accurately, and everything seems a bit fuzzy and distant. Try balancing a programme suffering from this, and you’ll probably notice everyone else cowering at the back of the studio to get away from the excessive monitoring level that sounds perfectly normal to you! Another common form of hearing change is tinnitus, or ringing in the ears. This is a result of damage to the microscopic hairs which sense sound in the inner ear. Nine times out of ten it goes away, but for 15% of us it doesn’t, and once acquired, tinnitus can never be cured, only masked by other sounds. It seems to be brought on by short exposure to high volumes of sound with a lot of high frequency content and can also be triggered by explosions or other loud impact sounds. (Now you know why Clint Eastwood always wears ear defenders on the firing range.) Tinnitus sounds worse when you’re tired or ill, or when you’re in very quiet surroundings. 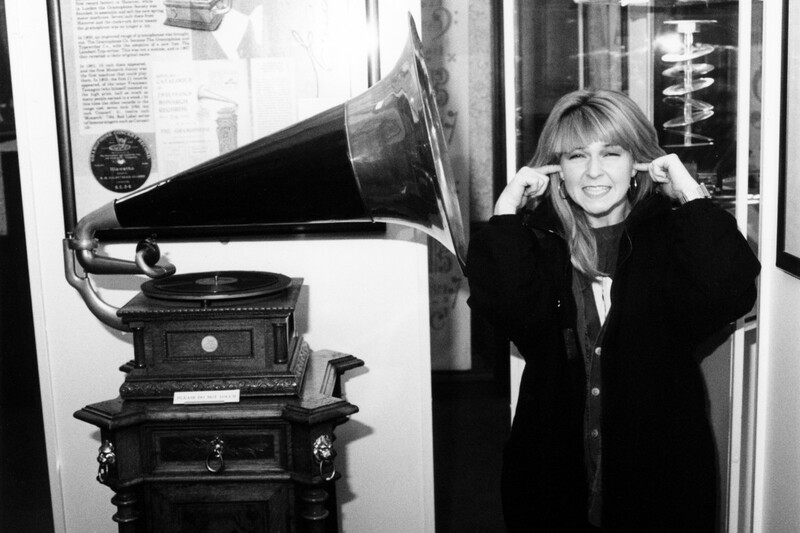 Different people hear the ringing at different frequencies. Mine is usually quiet and high pitched in both ears, but a distinct lower tone can be very distracting – especially for singers – who hear it as an internal dissonance. Some sufferers hear such loud tinnitus that it can prevent sleep, and the condition has even been known to turn people suicidal. The third major form of hearing damage is noise-induced hearing loss or noise-induced permanent threshold shift. This occurs very gradually and often goes unnoticed by the sufferer for a long time. Like tinnitus, once the damage is done it is irreversible. It can be a problem for those in any noisy environment for extended periods of time: sound studios; rock bands; concert orchestras; heavy industry; even motorcyclists can suffer from it! Most commonly, noise-induced hearing loss manifests as a decrease in sensitivity at a frequency of about 3 to 4 kHz. (In musicians this often happens in the ear closest to their instrument!) It takes a while to notice any change, but the most obvious sign of damage is finding it difficult to distinguish speech in noisy places like pubs, or when hearing voices over music in a mix. This is because the loss in sensitivity happens at precisely the frequency where we gain the most clues as to what is being said, i.e. in the ‘presence region’. You may wonder if I have an axe to grind, after 20 years in the BBC, mostly spent working either as a sound engineer or radio producer? Well, it was noticeable that management kept very quiet about sound safety in my area! I already had tinnitus when I began making The Science of Sound for Radio 4 and the World Service in 1989. (Seeing Van de Graaf Generator and Jimi Hendrix play the Royal Albert Hall twenty years earlier was a narrow escape, but a punk gig in Manchester probably laid the foundations, and a varied BBC career finished things off nicely!) But interesting research emerged in the course of making The Science of Sound series which seemed to indicate a grim time ahead for the ‘walkman generation’. It made me very aware of just how loudly some of my colleagues listened to headphones when working as tape-ops or when editing, and brought other issues to mind, like what was a sensible sustained monitoring level in a studio, and what should you do if you’re working with someone who insists on listening impossibly loud? My new awareness led me to try a number of types of ear defence in an attempt to minimise the risk to my hearing whilst at concerts, or travelling on motorways or long-haul flights. Ear muffs work well, but are bulky and obtrusive. Foam earplugs are efficient, but definitely not the things to wear to a gig if you want to keep any sense of excitement or occasion – and if you wear them while travelling they are far too isolating, and make your own voice boom! So I was thrilled when I found out about a Dutch company with a UK office that makes broad-spectrum sound attenuating earplugs. The company in question, Elcea, manufacture a wide range of custom hearing protection in the form of individually-fitted pairs of earpieces. Their Elacin range of products act as passive attenuators, and can reduce the amount of sound reaching the eardrum by between 15 and 32 dB, depending on your requirements. The earpieces are made from soft silicone, and each has a sound filter which acts as an attenuator and controls the frequencies reaching the ear. The device which most interested me was the ER-15 (£120 +VAT per pair), offering a modest 15 dB of volume reduction across the entire audio spectrum, but with an amazingly flat frequency response from at least 125 to 8000 Hz (±3 dB). I quickly made an appointment for a fitting, and set off to Harpenden! Elcea’s UK operation is run by Andrew Shiach, who is reassuringly knowledgeable about hearing problems, and is especially sympathetic to the needs of sound engineers and musicians. He soon set me at my ease as he used a miniature video camera to show me my own ear-drums, and to check that my ear canals were suitably wax-free for my earpiece ‘fitting’. To make sure the ER-15’s can do their job properly, Andrew needs to make an exact impression of each ear canal using a quick-setting silicone-based foam. He inserts a protective wad of cotton wool into each ear to protect the drum, then gently injects the bright pink foam which takes about five minutes to set. During this time you experience one aspect of what it really would be like to be deaf… almost complete loss of hearing! It’s not an entirely true representation – because by all accounts many profoundly deaf people are plagued by noises of other kinds – but the sense of isolation from everyone else in the room is real enough! When my time was up, Andrew Shiach popped the rubbery impressions out, and the world came back with a rush, thank goodness! To personalise a set of ER-15’s, a smoothed version of the impressions is made from a more durable clear silicone with a central hole to conduct sound and a special plastic diaphragm to act as the ‘resistor’. The overall length of your earpieces is finely tuned so that the resonance matches your ear canal, giving a perceived ‘flat’ response at the ear-drum. Andrew Shiach is well qualified to represent Elcea in the UK, having been an audiologist for some twenty years. He became involved in hearing protection because, as he puts it, he would rather “help prevent deafness than have to treat it!” Now he has made sets of ER-15 earpieces (or the higher attenuation ER-25’s) for major pop groups and musicians, sound engineers and roadies, as well as conducting experiments with the BBC Philharmonic and Symphony orchestras. A useful side-effect of attenuating loud sounds on stage or from mechanical sources like planes and cars is that speech becomes much easier to distinguish from the background noise as the level of the overall sound is reduced. This has made the ER-15s very popular with pilots in the Dutch airline KLM, who can hear each other and radio communications better, and are apparently less fatigued on long haul flights too! Another satisfied customer is a TV cameraman specialising in motor-racing, who can now hear the director far more easily over the roar of the passing cars. An important point that came up in conversation with Andrew Shiach is the increasing trend towards to in-ear monitoring. He is pleased to see companies like Sennheiser taking a sensible attitude towards marketing the product. “If you’re going to use it, use it safely! We would like to see users of in-ear monitoring buying their hardware off the shelf, then having their earpieces made individually, so that they have the ear-pieces that are right for promoting good hearing conservation.” Personalised earpieces offer the best chance of lowering the sound levels reaching the ears of performers, presenters and sound crew, since less volume is needed to overcome the p.a. and any monitor mix if a perfect sound-seal isolates the ear from the sound on stage! If you have any doubts about your ears, a hearing test specially designed for sound engineers and musicians is available at The Hearing Healthcare Practice, which shares Elcea’s UK premises. The test costs £50 + VAT, and uniquely charts hearing ability in the important high frequency region above 8 kHz. If they find any problems, they can offer advice and a possible regime for hearing conservation and protection. Whereas it is relatively easy to predict hearing losses for a rock guitarist or a violinist, according to Andrew Shiach it is impossible to build up an ‘average prognosis’ for us sound engineers because we do such varied tasks. “Hearing loss is all to do with the time you are exposed to noise,” he says. The Health and Safety Noise at Work Regulations 1989 recommend a maximum of eight hours at 85 dB without hearing protection. Above 85 dB, protection should be provided on request, and from 90 dB protection is mandatory. The bottom line is this: if your livelihood depends on your ears, look after your hearing today or you may not be able to enjoy listening – or make a living – with them in the future! Clive Williamson worked from 1974 to 1994 in B. H. London, first as a Technical Operator and then as a Studio Manager. He has been an Trainee Assistant Producer in BBC Television, and a radio producer for both Schools and Continuing Education. After a period of job-sharing he left the corporation to pursue a career as a music producer, technology journalist and as a composer and musician with the ambient group Symbiosis. 1. Avoid prolonged exposure to loud sounds, and always use hearing protection if it is provided. 4. Use open headphone designs in preference to closed ones – avoid in-ear walkman types if you can! 5. If you use headphones a lot for work, try not to use them in your leisure time too! 6. When it’s essential to listen on closed headphones, use a pair with good insulation from the outside world so you can keep the volume down. 8. Take some form of ear defenders to concerts, in case sound levels get out of hand! 9. If you use ear defenders regularly, make sure that they are clean and not a source of ear infection. 10. Use the quietest possible environment for editing so that you can keep levels low. This is especially important with digital recordings, which have a very wide dynamic range and often have to be turned up very loud to check edits! 11. Try turning everything down a notch… Your ears will appreciate it, and you’ll be monitoring more like the listeners at home. 12. Rather than turning your amp up to overcome unwanted talk in the cubicle, let everyone know that you can’t hear properly – they may pipe down! Clive later acquired the softer ‘Sleepfit’ versions (approx 30 dB) for noisy hotels, and solid fitted plugs for protection in very loud or unpredictable environments. 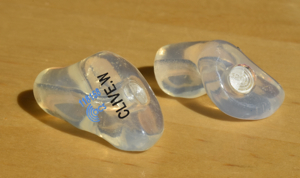 * Update 2007 – Elacin introduce 9dB filters (ER9) for musicians and generic ER20 earplugs (‘one size fits all’ for about £13!). Elcea now offer a range of in-ear monitoring solutions and custom in-ear headphones which offer much reduced listening levels at the ear in noisy environments. The shape of our ear canals can change as we age or gain or lose weight, so it is a good idea to check every four years or so that your custom hearing protection is still working efficiently. If the earplugs have become too loose, sound can leak around them and put your ears in danger again. I sensed that I needed a refit in 2016 and found that Andrew Shiach (interviewed above) had used his years of experience to develop a new range of solutions for personalized hearing protection, which are now avaliable from his UK-based company ACS (Advanced Communication Solutions). Their tailor-made products include earplugs for musicians and sound engineers; in-ear monitoring and communications systems; and even impulse attenuating filters designed for shooting! From a range which includes 10, 15, 17, 20, 26 and 27dB of sound attenuation, I decided to try some PRO17 custom-made earplugs with 17dB sound ‘filters’, which – according to their test results – offer the most even attenuation across the ear’s frequency range. As I now live in Devon, I had the new impressions made by ACS’s local representitive and the new earplugs arrived in the post soon afterwards, etched with identifying numbers and text. The earplugs are made from soft medical grade silicon and there is a wide choice of colours to choose from. The fit was snug and comfortable and subsequent use has proved that the sound reaching my ears is well balanced and neutral as promised. The 17dB of attenuation is perfect for going to jazz and rock venues and is even appropriate in some cinemas where the maximum sound levels seem to have risen dramatically. I also use the new earplugs when travelling on trains and planes and some buses, and especially when using power tools around the house and garden. Hence I’m very pleased with the ACS PRO17’s and would recommend them to anyone wanting to protect their hearing for the future, or wishing to see live music having already done some damage! A problem in the past was that the master impressions of your ear canals could only be stored reliably for a few months, making reordering difficult, but an interesting development at ACS is that the company now digitizes the ear impressions so that new products can be made from freshly 3D-printed moulds months or even several years later. Great if you know the fit is still correct but you happen to lose one or both earplugs, or you need an extra pair!